Is space an issue in your classroom this year? Do you feel like you are up to your eyeballs in students? If your secretary calls you one more time saying she has another student for you, will you literally break down in tears at school? Is your closet already stocked with chocolate, your favorite caffeinated beverage, and an industrial size bottle of Tylenol? If this is your year, continue reading. If this isn’t your year, you should bookmark this page, because it might be your turn next year. My second year of teaching I had 32 students and only 28 desks. Yes, you read it correctly. More students than desks. Crazy, right?!!! I did eventually get enough desk, but it took awhile. And to put a cherry on top of it, this was my second year of teaching. Thankfully my school was full of “Mother Hen” type teachers who took me under their wings and graciously shared their secrets with me. I thought I’d pass along one of the nuggets today in case you find yourself in the same predicament. It seems like it’s this time of year (and in January) when you get an influx of new students. Why, I don’t know, but it seems to work than way. How do you teach reading in a small group when you have limited space? What do you do with the other students if you don’t have room to set up centers? The students need to be engaged in something productive and engaging so they won’t interrupt your lesson. The answer is a self-contained center . . . a.k.a. file folder centers. Instead of going to a separate table or carpet area for center time, students use their desks for center time. The file folder centers are small and self-contained. As a general rule, it should only takes one student to use this type of center. You can make file folder games for more than one students. But, this is dependent upon what type of desk you have and the arrangement of them. Many centers can be adapted to a file folder center. All it takes is a little ingenuity. These Sentence Shuffle Centers worked in more ways than I had originally planned. They improved my students’ fluency rate which helped their reading levels. I absolutely LOVED them as a fast finisher activity. You know those students who see class work as an Olympic event! They are the ones who always finish their work in half the time as the rest of your students and then you wonder what to do with them. The answer . . . tell them to go to your tub of folders of Sentence Shuffle Centers. They can take it back to their desk/table and work quietly. Sentence Shuffle Centers can be set up as traditional centers or as a file folder game. Here is an example of how I made my Thanksgiving packet into a file folder game. I used the center sign for the front cover. It has a white background so it doesn’t take too much ink but still has some color to make it inviting to students. Inside the folder is the sentence shuffle sheet where students stack the word phrase cards. This sheet is laminated on the folder. The word phrase cards are kept in the 6 X 9 white envelope on the left. The white envelope is laminated on the folder. Laminate the envelope with the flap down. Then take a knife and slice the flap open. Use velcro to keep the envelope closed. Glue and laminate a 9 X 12 envelope on the back of the file folder. Laminate the envelope with the flap down. Cut the flap open with a knife after you laminate it. You will store the writing sheets in this envelope. This form can be used different ways. 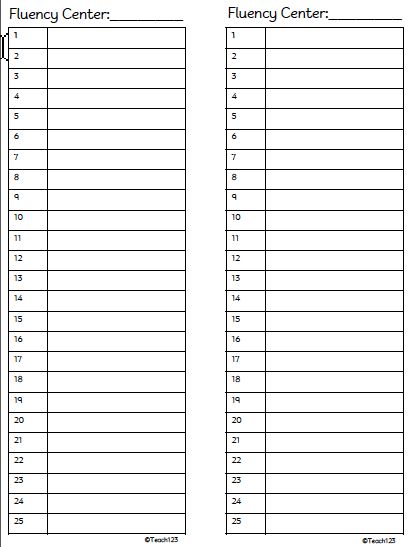 You can either laminate it on the folder and have your students write their names with a marker. Or you can tape a form on the folder each year. I have 2 different versions of the form for you. You can either download the PDF version or you can download the Powerpoint version so you can type in your students’ names. I have Sentence Shuffle Centers for grades K-5 in a variety of topics. Click on the pictures below to see them. These are some good ideas. I wanted to share one thing that I do to save space. I put my centers in bags and number them. then I use the hooks that you stick on the walls and hang up the centers. The children get their bag and work on it either at their desks or in a quiet area on the floor. I had 33 kindergarteners my second year of teaching; however, I was lucky to have a large room and an aide, but not much storage. I managed to do centers and individual skill rings for each student in a half-day program. That was a long year! Such great ideas!! Thank you for sharing! Smart!!! I can totally relate to the lack of space thing. Thanks for linking up! What a great idea…off to share it on Facebook and to repin the pin that brought me here. I'm always looking for innovative ways for classroom setup! Thanks!